I believe there is a certain depth and beauty in a home, no matter how humble, when there is grace and love in a kitchen that is alive with the warmth of good things cooking for our families and friends to eat. To wait for the luxuries--or to postpone quiet pleasures that are at hand, in the race that is propelled by fashion--is to miss a part of life that is meaningful. 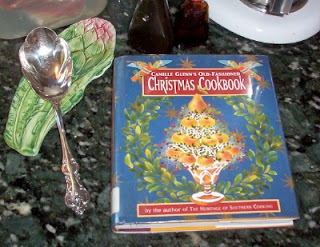 --Camille Glenn's Old Fashioned Christmas Cookbook, p. xiii.